Introducing Inferno Puzzle. The newest very simplistic puzzle game with darker theme and 80s retro style graphics. 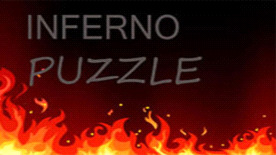 Inferno Puzzle currently has 19 levels and a simplistic menu. All you need to do to pass levels is simply arrange and match 3 or more of the same tile to succeed. You get points and stars. 3 Stars in level are maximum. In every level there are 10 moves to use.